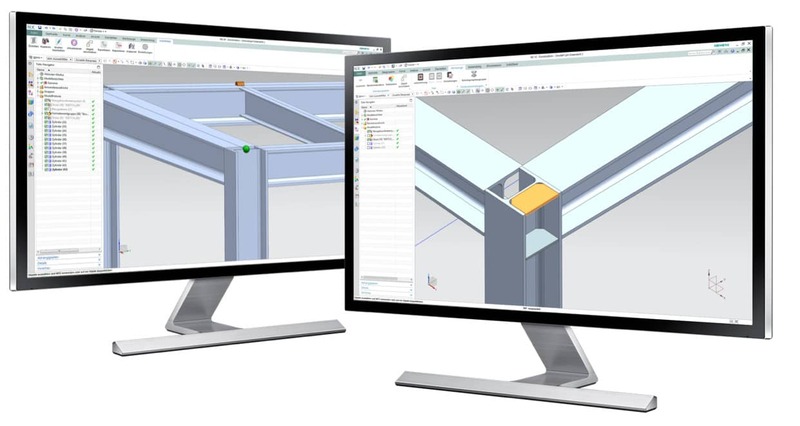 With SolidSteel parametric for Siemens NX, structural steel design constructions can be built up much faster and more efficient. Therefore many user friendly functions are available. All of these functions have been modified for the typical working methods in steelwork. This software solution can be used independent from any branch. Wether you use it for classic structural engineering or constructions in plant and mechanical engineering. Using the powerful construction functions of SolidSteel parametric, there are no limits for your ideas. 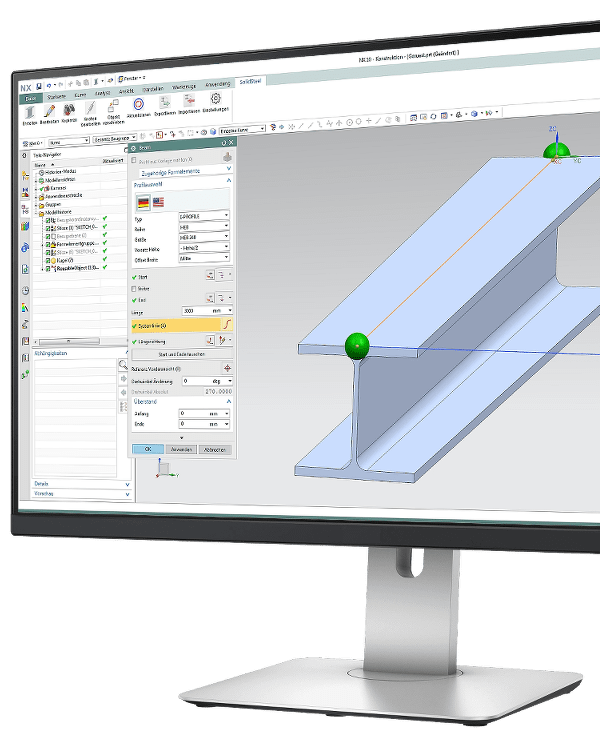 In the same way as we did for the other versions it was important for the development of SolidSteel parametric for Siemens NX to integrate the system as deep as possible into the operating CAD system. „SolidSteel parametric is no external solution. Its integrated into Siemens NX by 100%.“ - Thats not just more comfort, it makes work more efficient without any data exchange issues. With SolidSteel parametric you are working with native Siemens NX files. Using the SolidSteel parametric Connect module, there are many typical steel connections available by default. 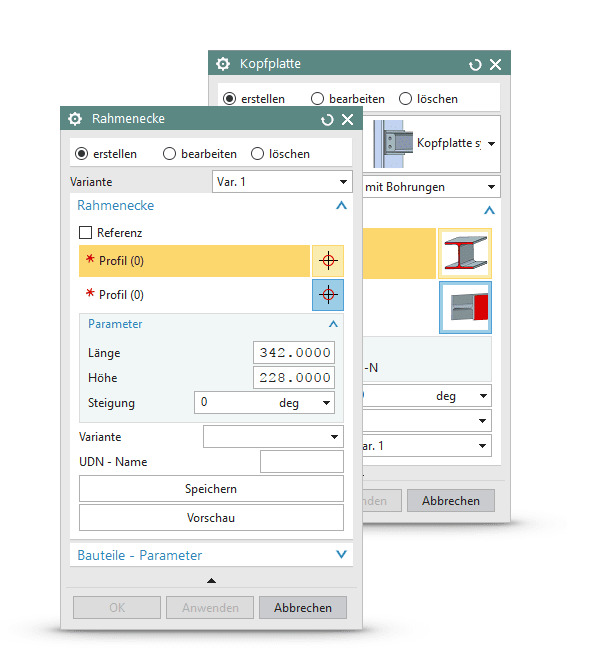 End plates, base plates, ribs, gusset plates or even whole frame corners will be created and inserted to the construction with only a few clicks. Depending on the functions, the geometrical values will be calculated from the construction parameters, inserted manually or taken from provided libraries like e.g. DAST. Of cause, these libraries can be extended by the user. For example, SolidSteel parametric will suggest fitting end plates immediately after selecting a profile. For complex connection types like frame corners, many different parts will be generated and adjusted by one function. Of cause functions like that are included in SolidSteel parametric and all possibilities of the software, like the changes of the construction, are still available. With our SolidSteel parametric for Siemens NX newsletter, you will be always Up-To-Date. Sign up for free. Please login to receiver special information for sales partners. If you have no account on our website, sign up for free.